He started his career with London Transport and in 1987, led the recovery of 30 bus garages following the London Hurricane. Following this Richard went on to open one of London’s first ever business recovery centres in the early 1990s. For the last twenty years, Richard has been working at senior management level within two major wholesale banks. 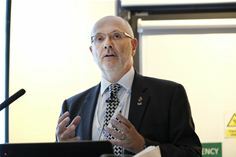 At BNP Paribas, he was the Head of Business Continuity Management UK, and Service Continuity Management, France and UK. At J.P. Morgan, he was the corporate & investment bank’s regional Head of Business Resiliency for Europe, Middle East and Africa. The appointment of Richard reinforces Databarracks’ growing presence and expertise in business continuity services. Last year, (July 2017) the company announced that Mike Osborne, former Managing Director of Business Continuity, Cloud & Hosting at Daisy Group, had joined Databarracks as its first ever Executive Chairman. As part of his new role, Richard, will work directly with Mike and managing director, Peter Groucutt, to continue growing the business and enhancing its existing products and services. Databarracks is the UK’s specialist business continuity and IT disaster recovery provider.